Students should also see this within themselves. The Students with stereotypes might go through this and feel very different in between the classroom. Students should help each other relate and open up. The teacher is a big component to this as well, she can allow students to understand different cultures and disband the stereotypes as well. I liked your blog. While I really enjoyed this article, I really couldn’t help nut think how can we have equity between the students… This kind of foes back to when we discussed bullying. What can we do with kids to make each one of them look at each other and know that this person deserves just as much support and the same amount of kindness that I receive. But when were talking about equity in the general sense I feel that schools do a lot to make sure all students get fair treatment in schools, however they need to reach out to the students that need the assistants. I’m not sure what you meant when you mentioned “support from the student’s peers”, but I got the impression that you were referring to the student’s own classmates or friends, which actually sounded like an excellent idea to incorporate equity into the school system. The teacher’s, or any other adult’s, support in the student’s educational needs comes as no surprise in most cases, but to have kids their own age back them up sounds like it could be taken a lot more seriously. Kids today seem to hold each other up to a lot of high social standards which have the power to shape the lives and decisions of any child, while the adult’s standards aren’t usually taken as seriously, unless they are really dedicated to that child’s overall well being in the school. It could even offer a different perspective to what the student’s are actually learning from the material given to them which could also lead to keeping the school’s curriculum more relevant to today’s social issues. Hi Hannah, I really liked the pictured quote at the beginning of your blog because it is a very true statement. Fairness in schools means providing students with the things they feel they need to be successful. I think the school system has forgot about the students. I remember reading a part in Goldstein’s book about how funds were allocated all over the place except in schools. I think that is still going on today and that is why schools are not fair You stated that “teachers and administrators have to see the needs of their students and help the students get to a point where they feel like they are being treated fair and given equal opportunities to succeed.” I think that is so true and probably the most important piece in making schools more equitable. We all know that the brown vs. board of education was supposed to end segregration in schools, but has it really ended it? That is something I think about alot because there are HCBUs which are black colleges and the majority of the school systems have schools that have blacks and schools that have whites.I think equality starts in making sure we continue to integrate our schools and allocate funds and adequate school teachers amongst all schools. First off, let me just say that I LOVE the picture that you started the blog with. While I agree, I also have to see that everyone needs to be provided that opportunity to have everything equally. We don’t know what a student could need sometimes if we aren’t able to provide it to them. It kind of ties in with the article form this week about School Funding and how it’s not all equal. Which you did make the distinction in you blog, but I just had to say what I felt about the picture first off. It’s easier for someone to just see the picture and forget the difference between fairness and equality. You also mentioned funding is not equal as well, and that’s something I mentioned in my blog and is covered in the funding article you sourced. It talks about other nations having equal per student funding from government revenue. How crazy is that?? How amazing would that be?? I think that is something to go with all how we could provide the funds for a lot of your suggestions. Thanks for a wonderful post! I really liked the picture and I have to agree with it. Everybody needs the same tools for them to be successful in life. Schools need to come up with a method in which every students gets the same education so they are all successful. Unfortunately some children are put aside and that’s when students start to fall behind. As future teachers we have to identify our weaknesses and improve our teaching methods in case a students falls behind. I overall enjoyed reading your post! Hi Hannah, I agree with you that without fair funding the children suffer the most, but it makes me think about how would we as educators use our tools to help students if we end up in a district with less tools, unfortunately due to the system of gerrymandering which I feel has to do with racism and although we which to change it, we keep repeating history, that’s why I think the teachers are the one who can make the difference. I agree with you that support from the teachers is what can make a huge difference, every small things counts! Teachers and administration should be equitable. Yes, some students will do more than you than others. Some will come early and help with setting up and some will never come on time. It is our job as teachers and professionals to never make one student feel more valuable than another because of what they do or their work ethic. In the same way, we should treat the student who never comes to class the same way we treat every other student. Equity is about being fair and impartial. This means treating all people or students equally. I like your quote there. 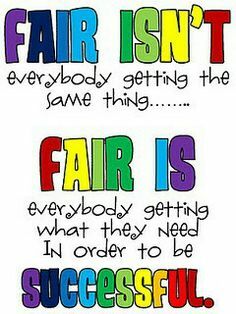 I agree that fairness should sometimes be based on what each student needs. Other times fairness must be completely fair.